It takes much more to summon Batman, you know. You had probably seen it coming…. Yeah, you certainly had. If you know any similar quirks of Python, be sure to present them in comments! 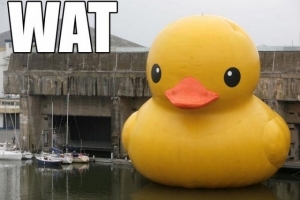 12 comments for post “The “Wat” of Python”. Xion, I recommend you to read O’Reillys “Learning Python” by Lutz and Ascher. Recently, I read that book (2nd edition) and everything what gryf wrote, is ideally described there. WAT about Ruby is very silly, because it doesn’t suprise any Ruby user. @gryf: Weird – it does work in 2.7.2 (tested on both Windows and Linux one), and you easily restore both True and __builtins__.True that way. while in reality yield does not behave like a function AND it can also receive values which ultimately leads to the puzzling None in the first example. On Python 2.5 it works just as you wrote. And about yield – you are using it in conjunction with lambda anonymous function, which by its definition should return something. And than you give yield statement. Well, I’m not sure (I have some suspicious though) what actually is happening but mixing those two is a bad idea. I agree with @gryf in general but I can shed some light on 1) WRT the yield inside a lambda. If you’ve read the docs, you’ll come to realize that Python’s lambda is a strange beast that is a relic of Python’s early history. A Python lambda’s body can consist of 1 and only 1 expression which is implicitly wrapped inside a return statement. See Python Language Reference section 5.12. The interpreter will complain with a SyntaxError because function params expects expressions, not statements. However, if you wrap it inside a delimiter like what you did (yield), now map() will accept it as a parameter. So what’s going on here? Well, your straw man example got around the Python parser. “yield” is only supposed to be used inside a function definition, so it goes thru the parser in this case because it is inside a lambda. Now, a “yield” yields the value on the RHS expression list. What’s on the RHS of (yield)? There’s nothing, just like and empty “return”. So when you invoke the generator “l”, it always yields None. See Python Language Reference section 5.2.10. Your second and third example are known problems with the Python 2.x, they are fixed in Python 3.x. Your first example is a little contrived tho, I don’t see how one “fix” it, or have it come up in real life tho. When you need to use () to get around something, that’s usually a code smell. Python’s lambdas that allow only for a single expression don’t appear strange to me. It’s limiting, of course, but there are well-known analogies in other languages, including lambdas in Boost.Lambda for C++98, or just every function (anonymous or not) in Haskell. IIRC a shortened syntax for C# anonymous functions and Java 7 syntactic sugar for Runnable/Callable interfaces also permit only one expression with implicit return. Most of your explanation of why this works as it does remains correct, of course. The only thing that is missing is to notice that yield works both ways: not only “returning” a value, but also accepting one, through send method of its enclosing generator (f() here). The second part is important, because it’s that very value which gets mapped over range(10). Obviously it will not work – interpreter complains about „’return’ with argument inside generator”. My suspicion here is that lambda is working a bit different than function – most probably it will return first element of generator collection that map will create, and because the yield itself works somehow as a return statement the chain breaks here. What is returned here is value first generator is returned – None. I’m not sure if this is correct unless some analysis of the python code is done. But since in a generator yield must be used to produce additional outputs this is ignored.